In this shot, Adam looks like he could be a teenager, not the youngest player at seven on his U10 team. He turned eight on his last game of the season. 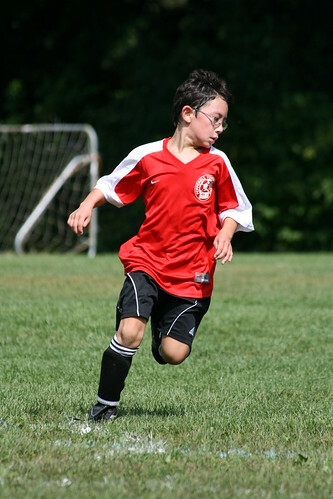 Adam's soccer team started out with a bang, but they had faltered since. 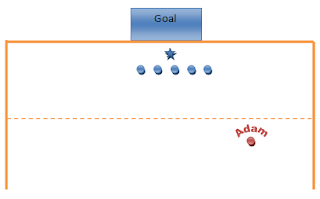 In the first couple games, Adam scored goals, but by the end of the season he was placed on defense because of his ability to run down the ball and clear it out. He was always asked to perform goal kicks because he has quite a kick. Here are two shots showing his powerful yet not always controlled kick. At Adam's second to last game, I took Dova and my camera, but her high-maintenance antics prevented me from taking many pictures. 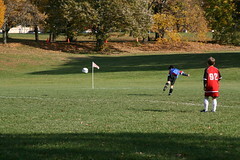 There was a penalty against the opposing team and Adam was going to perform the penalty kick. He didn't have a good angle being halfway to the sidelines as you can see below. Can you tell I spend too much time as a Powerpoint engineer? The opposing team lined up in front of their goalie with their arms up in the air. Adam stepped back and ran up to the ball. I took a quick picture with my camera and then put it down because I wanted to see his shot with my own eyes. He kicked the ball squarely and it soared into the air. The ball peaked several feet above the hands of the opposing team and then dropped down under the top of the goal and hit the back of the net. It was absolutely perfect, like a pro. The parents on our team jumped to their feet and cheered for Adam, and his whole team jumped up and down. I was beaming in pride for my boy. 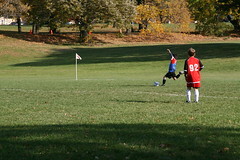 It turned out to be his team's only goal, and the opposing team scored a goal later on ending the game in a tie. Afterwards, I kept congratulating him on his awesome goal and retold the story to Doug over and over again.